Rosewood Little Dix Bay has a range of rooms, cottages, suites and villas available including the Garden View Room, Premium Ocean View Room, The Tree Rosewood Little Dix Bay has a range of rooms, cottages, suites and villas available including the Garden View Room, Premium Ocean View Room, The Tree House Cottage, Ocean Cottage and Beachfront Cottage. Each renovated room offers a stylish blend of charm, elegance and modern convenience. Suites include the Junior Rosewood Suite with breathtaking ocean views, large outdoor living area with outdoor garden shower and an oversized bedroom. The One Bedroom Suite are located on the beach with a patio. Villas range from two to four bedroom, each with sweeping ocean views from either the beachfront or hilltop. 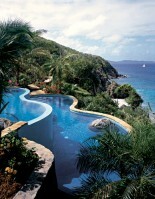 Rosewood Little Dix Bay is nestled on the beautiful island of Virgin Gorda in the BVI’s. Commercial flights are available to Tortola or St Thomas which can connect with an air-taxi, helicopter or water-taxi service. There are limited commercial connections to Virgin Gorda however private charter flights can be arranged. Little Dix Bay is a boutique Rosewood Resort, nestled on the untamed island of Virgin Gorda in the British Virgin Islands. Set upon a magnificent half moon beach, just beyond a colourful barrier reef, Little Dix Bay is a perfect tranquil island retreat and caters for the most discerning guest, in assuming elegancy and luxury. The island of Virgin Gorda itself is a national park, famed for its green rolling hills and isolated beaches, all surrounded by crystal clear waters and a myriad of wildlife. Little Dix Bay was established in 1964 with a vision by Laurence Rockerfella for an island retreat offering natural harmony an escape from the ordinary. For true relaxation, pamper yourself with visits to The Spa at Little Dix Bay offering the finest beauty and recuperative programs in an incomparable natural environment. The Spa offers a selection of treatments in a setting that captures the essence of relaxation and renewal. Using therapeutic practices and progressive concepts the treatments fuse botanical products with traditional, spiritual and healing arts. Little Dix Bay features a range of rooms, cottage, suites and villas, each nestled amongst thriving gardens and shaded footpaths. Each room is furnished to a high standard and offers a complementary blend of island charm, comfort and convenience. Each spacious room has a warm, personal charm and a considerate array of amenities. Guests will be entertained with a variety of facilities at Little Dix Bay and the endless variety of highlights on the island itself. Virgin Gorda is home to the famous Baths – a geographical landmark situated on the southwestern tip of Virgin Gorda. The Baths were created by large volcanic boulders which toppled over one another forming spectacular salt-water grottoes and pools. Guests may also enjoy one of the many hiking trails on Virgin Gorda, sailing or day trips to St John’s or Anegada or meandering through the Spanish Town, located just 15 minutes from Little Dix Bay Resort. Rosewood Little Dix Bay offers complimentary facilities including use of non-motorised water sports including kayaks, sunfish sailboats, snorkelling equipment, tennis courts and fitness centre. They also provide coaching or lessons where required and arrange walking tours, island picnics, nightly movies. Other available services include spa treatments, scuba diving, water skiing, fishing charters, island tours, babysitting services, private beach dinners and high speed WIFI access. Each room is equipped with telephone, Bose CD player, air-conditioning, mini bar, safe, robes and lady primrose bath products. 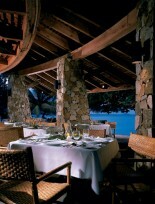 Dining options at Little Dix Bay include a variety of buffet style and al a carte restaurants including: The Pavilion: An upscale, open-air restaurant with magnificent views serving breakfast and lunch buffets, afternoon teas and an al a carte menu in the evening including international favourites with Caribbean flair. Live music is performed most evenings. The Sugar Mill: Enjoy a table on the beach and contemporary Caribbean cuisine and flavours provided in an intimate and romantic setting. Specialities include grilled seafood and meats made with fresh local ingredients. The Beach Grill: Is available for guests during the day for light lunches, tropical fruit plates and refreshing cocktails. Children’s menu’s and meal plans are available.